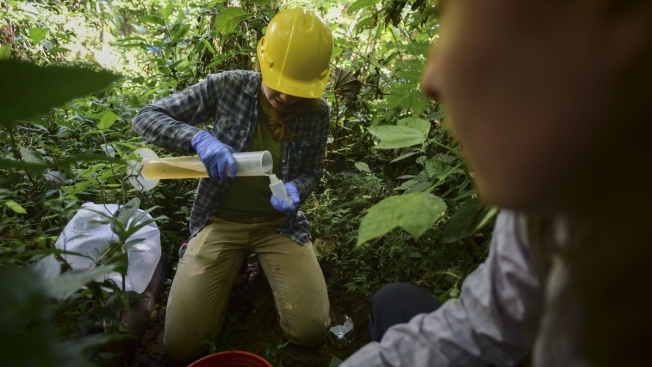 In this Feb. 13, 2019 photo, interns Carolina May, left, and Rosanise Odell, collect water samples form one of the warming plots inside the El Yunque tropical rainforest, in Rio Grande, Puerto Rico. The experiments carried out by the USDA Forest Service and the International Institute of Tropical Forestry, seek a better understanding of how tropical rainforests will behave in the global warming era. "It's a once-in-a-century opportunity to look at these two aspects of climate change together," said Tana Wood, a research ecologist with the Forest Service. Wood heads a team testing how plants themselves respond to higher temperatures. The 2017 hurricane season, with Maria following a lesser blow from Hurricane Irma, has given them a chance as well to see how storms affect the recovery of ecosystems already under stress, a key concern in the Caribbean, where scientists say warmer temperatures could lead to more intense hurricanes. On a recent trek to the site, Wood brushed aside thick branches and leaves the size of laptops as she made her way to three plots surrounded by infrared panels that heat the air and soil by 4 degrees Celsius (7 degrees Fahrenheit). The vegetation there was shorter and a bit browner compared with the three unheated control plots. The warmed plots run on 480 volts of electricity, and while the lines are isolated from the soil, the scientists use insulated boots to avoid getting electrocuted in case of an accident. Nearby, plant physiologist Rob Tunison clamped what looked like a small compact mirror around a dark green leaf to measure photosynthesis, spending 30 minutes to an hour per leaf. Wood said they are looking at how temperatures affect basic processes such as photosynthesis — by which plants transform sunlight into energy while absorbing carbon dioxide and releasing that gas along with oxygen into the atmosphere — as well as how soils respond. The researchers are also studying nutrients and microbes in the artificially warmed plots of land, keeping sending frozen samples to a lab in California for analysis. Knowledge about tropical plants and soils could eventually be plugged into models to determine how vastly broader ecosystems respond to changes. "We are also able to look at the potential for tropical plants and soils to acclimate to consistently warmer conditions over time," Wood said. Tropical forests play a key role in recycling carbon dioxide, and they store about a third of the world's carbon, she said. They also help generate rainfall across the world by releasing water vapor, which in turn creates clouds. "Anything that happens in these systems can have an effect on the world's climate," she said. U.S., British and international climate agencies reported this month that 2018 was the fourth-warmest year on record, and global emissions of heat-trapping carbon dioxide saw their largest spike in seven years. Overall, global carbon dioxide emissions have increased 55 percent in the past two decades, and Earth has warmed on average about two-thirds of a degree Celsius, according to the U.S. National Oceanic and Atmospheric Administration. British meteorologists said in early February that the next five years could see record-breaking temperatures. Scientists expect the world this year will spew 40.9 billion tons (37.1 billion metric tons) of carbon dioxide, up from 39.8 billion tons (36.2 billion metric tons) last year, according to studies by the Global Carbon Project. Kim Cobb, a climate scientist at Georgia Institute of Technology who is not involved in the experiments at El Yunque, said she was not aware of any other long-term warming experiments in tropical rainforests. "What will happen at their site is highly uncertain, because the rainforest itself controls so many aspects of the regional water cycle. It's not a system that we can model extremely well today, let alone under climate change scenarios," Cobb said. "But there is little doubt that these kinds of long-term monitoring sites are extremely valuable in advancing our understanding of the water and carbon cycle, and how they might change with climate change." The $3 million project, partly funded by the U.S. Department of Energy, is in its fourth year and Wood said she hopes it can run indefinitely. 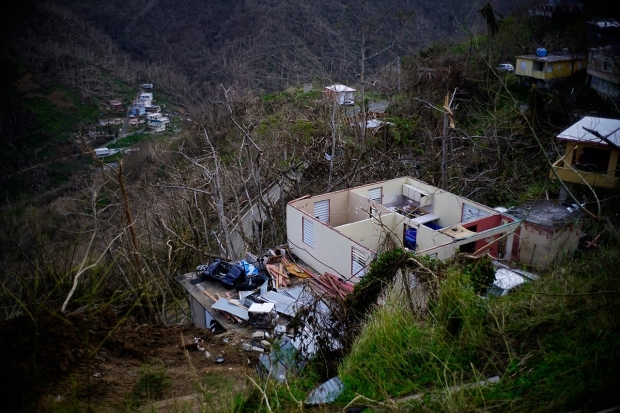 Scientists took a one-year hiatus after Hurricane Maria hit Puerto Rico on Sept. 20, 2017, so they could separate the effect of warming from the effect of the storm, which caused more than $100 billion in damage and toppled trees like dominoes. A couple of miles from Woods' experiment, scientists including those from the International Institute of Tropical Forestry are looking at how hurricanes affect the tropical forest. They began by trimming away the canopy leaves above patches of forest to mimic the effects of a storm. They hired arborists to cut tree branches and spread them across the forest floor to study how light and water move through the changed ecosystem and the impact that the debris has on soil microbes. They also monitor cloud base heights to get a sense of how changes could affect rainfall. Maria suddenly gave them a real-life test. "It poses a lot of challenges but a lot of opportunities to move the science forward," said Grizelle Gonzalez, a project leader. The experiments are expected to continue for several years, barring any interruptions from storms as the Caribbean prepares for another Atlantic hurricane season that starts June 1. Cobb, the global warming scientist, praised the ongoing experiments. "It is well worth the effort," she said. "The raw beauty of these environments is really only matched by their immense scientific potential."